Hematite is the mineral form of iron oxide. Hematite and ilmenite form a complete solid solution at temperatures above 950 °C.Hematite is colored black to steel or silver-gray, brown to reddish brown, or red. It is mined as the main ore of iron. 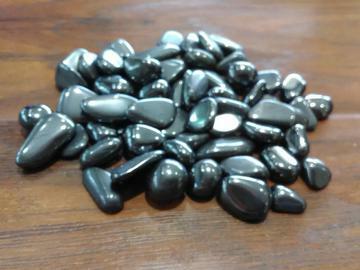 It is found worldwide.Gray Hematite is found in Yellowstone National Park in North America. Hematite is used to protect against geopathic stress and electromagnetic smog, and is said to be a great detoxifying stone, helpful for the liver and the blood.